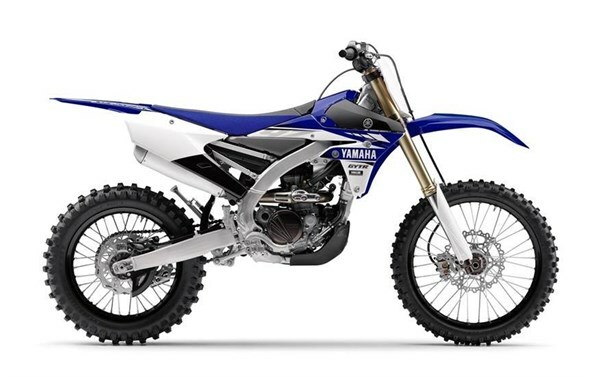 Click the button below to add the 2017 Yamaha YZ250FX to your wish list. Updated Engine: The all-new engine is based on the 2017 YZ250F, and includes a wide variety of updates: an all-new cylinder head, lightweight forged, two-ring, flat-top piston; a shorter, more durable piston pin with diamond like carbon (DLC) coating; a revised piston oil jet, and all-new connecting rod, crankshaft, and counterbalancer designs. Together, these updates improve peak power, power delivery and overall durability. New Chassis: Nearly the same bilateral beam frame that is found on the championship winning YZ250F is used on the YZ250FX. Changes for 2017 include an all new forged section at the swingarm pivot, and revised engine mounting brackets for nimble lightweight feeling in the tight technical terrain while still providing stability in fast sections. New Piston: A new lightweight forged two-ring piston uses a flat piston crown surface with additional strengthening ribs and a shorter, more durable piston pin with diamond like carbon (DLC) coating. The new piston is lighter, significantly stronger and together with revised EFI mapping, improves combustion performance for a faster, more thorough burn, resulting in excellent pulling power. New Crank and Connecting Rod: Optimized crankshaft and counterbalancer designs feature a revised balance ratio, predictive power delivery and reduced vibration. A new nickel-chromoly steel connecting rod offers additional durability to handle the increased power output. Stronger Crankcase: The crankcase features a new heat treating process to increase strength, for protection, the frame welcomes the addition of a rugged plastic skid plate. New 270mm Front Brake: 270mm front disc (up from 250mm) brake coupled with new pad material offers outstanding braking power and performance. Revised Suspension Systems: Both front and rear dampers feature optimized settings for 2017 to further boost overall suspension performance, while the front fork utilizes a stronger oil seal system for enhanced durability in the toughest conditions. Updated Indicators: Thanks to a new WR®-style fuel level sensor in the tank, the 2017 YZ250FX includes a convenient fuel level and engine warning indicator on the handlebar. Easy Servicing: Redesigned air cleaner cover helps prevent contact with the quick-release quarter-turn Dzus® air box fasteners for tool-less access to the air filter. Rake (Caster Angle): 26.3 deg.